Inspired By True Events - This strip is soooo autobiographical. This strip is soooo autobiographical. 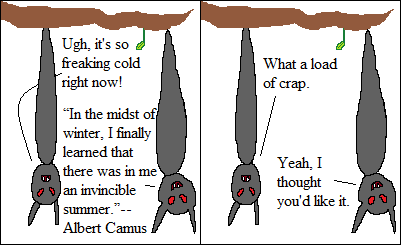 I saw this quote today and immediately thought of this comic, if only because no inner summer can beat the cold, snow, and lack of sunshine of winter. Man I need to move south. Somebody put that on my to do list. Thanks. By the way, I’m putting the cast page up today. If you don’t see it, then I did something wrong! Woo!